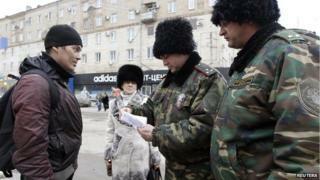 Russian security forces in the city of Volgograd have detained more than 700 people in a crackdown following two bomb blasts which killed 34. Officials have not yet linked any of those detained directly to the bombings in Volgograd on 29 and 30 December. A policeman, Dmitry Makovkin, has been buried with full military honours. He allegedly stopped a suicide bomber just before the railway station blast. Five of the 62 injured being treated in hospital are critically ill.
Thousands of police officers are conducting checks on public transport, stopping cars and questioning drivers as well as other individuals at markets and shops. Cossacks - traditional paramilitary enforcers in southern Russia - are patrolling the streets and buses to help police, as are local volunteers known as druzhinniki. Russian investigators believe that both suicide bombers were men who had arrived in Volgograd from the North Caucasus, a security source told Interfax news agency. The bombings were similar to previous indiscriminate attacks by Islamist militants operating from the North Caucasus, where violent anti-Moscow separatism is rife. No group has said it carried out the attacks, but analysts say the bombings could have been an effort to derail the Winter Olympics in Sochi, which begin next month. The first bomb attack took place at the city's main railway station, and the second - the following day - ripped through a trolleybus. Volgograd was in mourning during the traditional New Year holiday - and the mourning period only ends on Friday. The city, called Stalingrad in Soviet times, is a powerful symbol for Russian patriots, because of its key role in the defeat of Nazi Germany in World War Two.